Already established in the US, Narrative created the ecommerce site for fashion brand, Velvet Tees, UK launch. 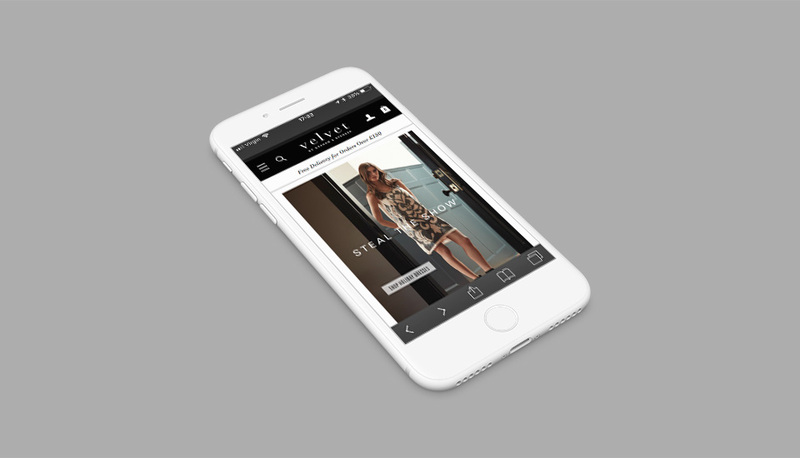 Optimised for mobile & tablets, the responsive design of the fashion eCommerce website adapts to any screen size elegantly, to stay on brand however customers choose to view the website. The UK version of Velvet Tees fashion eCommerce website is geo-fenced and was launched on Shopify to take advantage of its speed & reliability. Jenny Graham & Toni Spencer launched Velvet Tees back in 1997, with the goal of creating fashion forward tee shirts. Velvet Tees has evolved to include full ranges of menswear & womenswear and gained recognition for their meticulously crafted collections. Manufactured primarily in the United States, Velvet by Graham & Spencer can be found in boutiques and premiere department stores nationwide and internationally.